As I began to devote myself more fully to writing these past decades, I also found it useful–necessary?–to have something else to work on. Something I didn’t take quite as seriously as writing and perhaps with clearer criteria of “good” or “finished” or “success.” When I was in grad school for writing, I spent a lot of time in the darkroom with photography and found the visual a relief and very freeing. Eleven years ago I had kids, which in my mind qualifies for “something else to work on.” About 5 years ago I started running again and found running and training a dreamy place where I could work hard, exhaust myself, always know what to do, and improve (and also stand up! I get so tired of sitting…). It seemed the perfect pairing for life as a writer. My relationship with running is a rather uneven one: I started running in 1994, ran happily until 1998, when I started training for a marathon, developed bad tendonitis in my ankle, and as I did not have health insurance or money, the only fix that worked was to stop running. I started running again in 2000, ran through 2004, did something to my knee, saw a doctor who told me to stop running, so I stopped running. Took 10 years off, started running again in 2014, and totally fell in love with running again. In late 2014, I injured myself (small tear in glute muscle) (small tear does not describe how much this hurt, I couldn’t really walk for some time). Did some PT, started running again a few months later and ran happily throughout 2015. I started weight training at the same time and working with a running coach in the hope that I’d prevent further injuries. I trained for a half marathon in early 2016 and actually ran a half marathon in May 2016. The day of the race was one of the happiest of my life. I loved the simplicity of that happiness, which was much less complicated than the happiness that comes with writing. I began training for another half marathon in the summer of 2016 but injured myself in early fall two weeks before the race (did something to my hip so I couldn’t really walk without intense pain for a while). I finally started running again in early 2017 after doing a lot of PT because my hip still hurt. My hip continued to hurt. In May 2017, finally, I could run without anything on my body hurting (yay!). So I began training for a fall 2017 race. 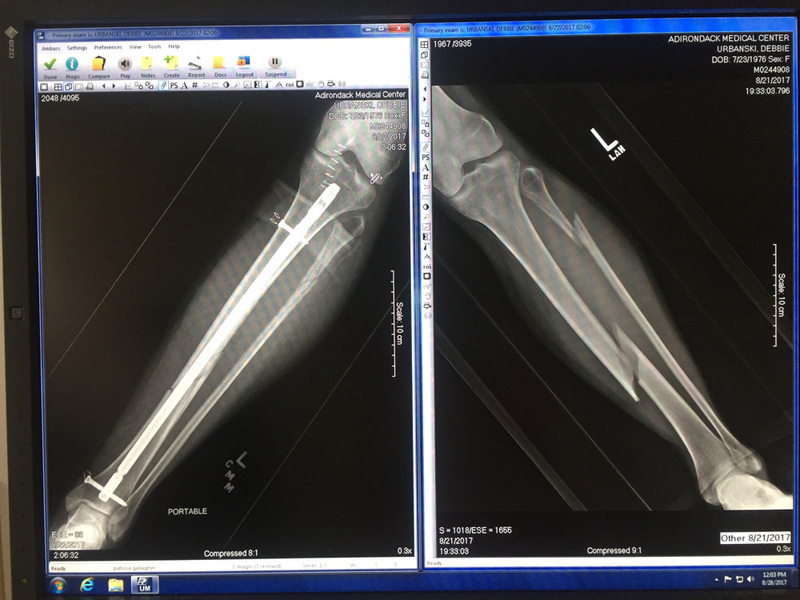 In late August 2017, eight hours after I completed a beautiful morning run on Heart Lake Road in the Adirondacks, a few hours after summiting Algonquin Mountain during the solar eclipse with my family, minutes after I thought to myself, “Wow I’m finally feeling strong and uninjured again, this is great!” I fell (read about the accident here or on The Millions here), broke my ankle and fibula and tibia, got helicoptered off the mountain, and had emergency surgery in Saranac Lake around midnight. While lying on the roots of trees and on the ground on the side of a mountain, with my leg at an awful ankle, my husband and kids gathered around me, helpful strangers gathered around me, I had a lot of frantic thoughts. One repeating thought was what about my race in October. Actually, it was more like, WHAT ABOUT MY RACE IN OCTOBER WHAT ABOUT MY RACE WHAT ABOUT RUNNING WHAT ABOUT MY RACE RUNNING RUNNING and so on. 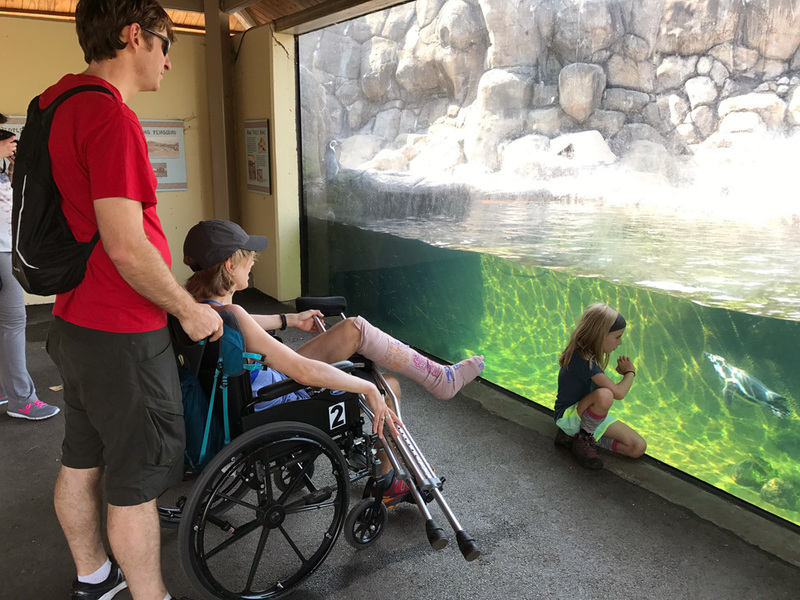 My husband said, “That isn’t what you need to be worried about right now.” He was more concerned with getting me off the mountain and making sure I could walk again. But as I waited for a forest ranger to descend from the sky in a helicopter and rescue me, I continued to worry about running and I raged about the possibility of me not running and I panicked about that possibility. This excessive worrying may sound odd to non-runners but is probably relatable to runners. When you are running, it’s what you do. If you love running, then having running taken away from you is really unthinkable. Once I got off the mountain and into the ER, I mentioned to pretty much everyone — nurse, doctors, surgeon, anesthesiologist–that I was a runner, and would I be able to run again? Everyone shared stories with me about injured athletes who recovered and were able to return to the sport they loved. 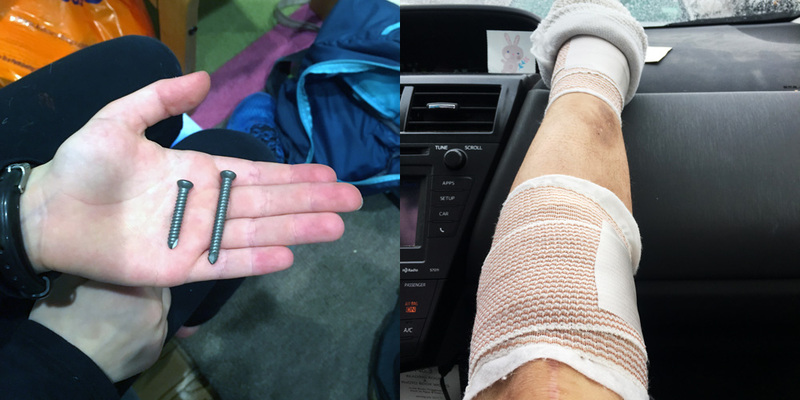 A nurse shared that several years ago she had the same injury as I did, had similar surgery, and she just finished running a marathon. My surgeon told me that he was confident I would be walking okay by Christmas, running by Easter, and running well sometime after that. Which is why I wanted to write about my experience here. Because out of all the people I spoke with along the way, the medical professionals and the other runners, and all the articles I read desperately online about people who had similar injuries, the narrative was always about regaining whatever had been lost. No one told me or hinted to me that some things might be lost for good. Late December 2017, 4 months after my accident, I was allowed to ride a bike again, and early February 2018, I was allowed to run. I enjoyed running for maybe half a second before I found out that it hurt. I was devastated to find even a minute of running hurt. Not just soreness but shooting pain every time I pushed off of my left leg. The pain was localized around the screws going through my ankle and the screw going into the top of my shin. I went back to my doctor and asked if he could remove all the hardware out of my leg. My doctor said no. Taking the rod out was a lengthy risky surgery. Taking all the screws out was risky as well as the rod wouldn’t be well-anchored anymore. But he said I could get out two screws, so I underwent another surgery in March, after which I was to do nothing really in order for the incision sites to heal. Two weeks after the surgery, my doctor said I was ready to get back to exercising. He wanted me to run and jump and do weight bearing exercises on my leg to help the bone grow back stronger. I tried running for a few minutes after my appointment and was once again devastated to find that running, once again, still hurt. In fact walking had begun to hurt. After studying my leg for way too long, I figured out my left ankle seemed to be caving inward without the screws. I went back to my PT and he helped straighten my ankle out with orthotics and exercises. He told me to wait a few weeks before I tried running again to let the inflammation die down. I did not try running again. Hiking season was approaching. I was worried I wouldn’t be able to walk this summer without pain. Walking properly was already requiring so much thought and energy. I had spent most of the past two years wanting so badly to do something I couldn’t do, i.e. running, and this had been an emotionally draining process. If I looked ahead in the upcoming months, I could imagine months of aquajogging to ease back into running (you are tethered to a wall wearing a flotation device while you make a running motion with your legs in deep water–about as fun as it sounds), the elliptical machine to cross train, PT exercises, PT, and perhaps further injury. Emotionally, I didn’t have the energy to keep trying. When my kind friends told me they were sure I’d get back to running in a month, or a few months, I explained no, I am not running again. I am never going to try running again. Maybe my experience is the exception. Maybe everybody else who had a tib-fib-ankle break and ORIF surgery, or any kind of injury really, ends up getting back exactly to where they started, and they can hike happily and run happily and race and all that. Or else maybe those kinds of stories are the stories we seek out and the stories we encourage people to tell. When I gave up running, it was a relief. It was awful. I realized life is okay without running and I miss running so much. I discovered yoga and that I like yoga. I like talking walks. I like riding my bike. I miss training for a race. My old running injuries, such as my hip, no longer ache. I’m no longer a runner. I will never run a race again. I am trying to think that this, what I’m going through, can be a happy ending too, or at least a true ending. And maybe true endings have some happiness in them because they are true. I gave up running and realized I could give up running. I had an accident and realized my body is not going to be the same again. I suppose this is a realization everyone needs to make as they move through time–our bodies will not be able to keep doing what they could once do. But hopefully we’ll find new things we can do, and one of those new things may include the ability to let something we love go. I ran passionately for a year and walked a half marathon due to foot injury. It was a painful journey. Having accomplished my goal, I stopped running and started swimming. Now swimming is my passion and my friends who are still running compliment me for developing a better body figure after switching to swimming. I still have the injury and I don’t think it will get better or worst. I can walk fine but can’t run more than 3km before the pain kick in. I don’t want to add any pressure to the now chronic injury. I’m a happy swimmer. If I had a choice between running and injury free, I would gladly ditch running. Health is permanent but we can always find another passion.